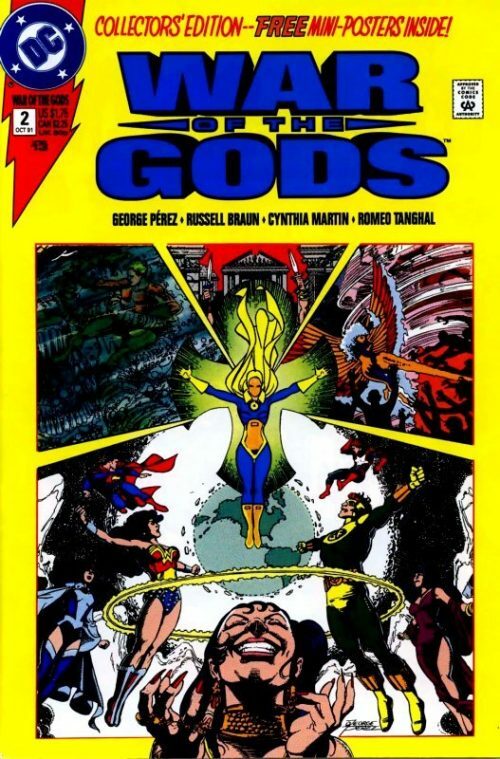 George Perez masterfully creates a believable set of events that set the stage for increasing public hysteria against the Amazons. After their triumphal arrival in Patriarch’s World in issue 50, it all comes crashing down like a house of cards around Wonder Woman and her Amazon sisters. The reader, like Diana herself, is still unsure as to who – or what – is really behind the framing of the Amazons. 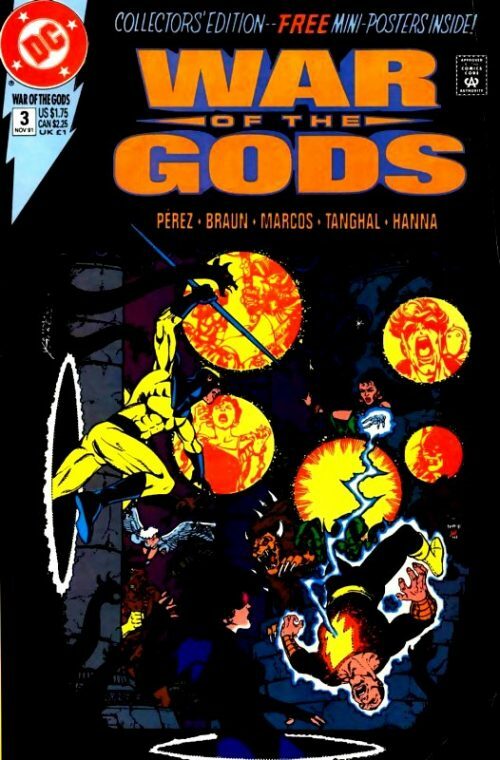 This is the penultimate issue before the “War of the Gods” cross over event begins and the answers finally reveal themselves. 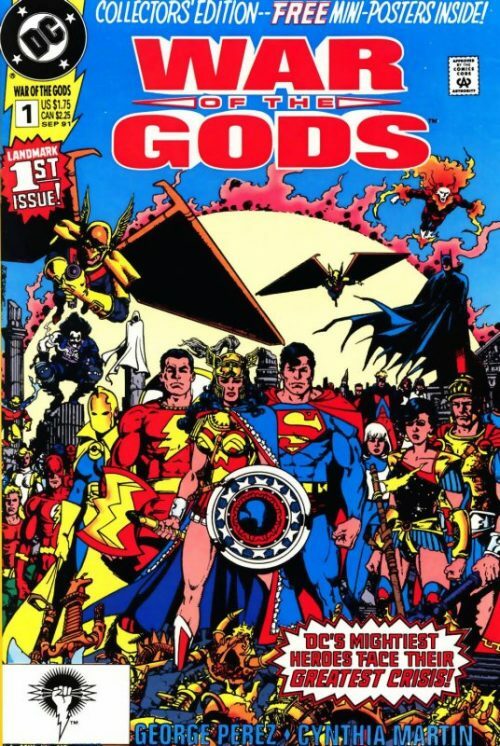 In some ways, this story line of Wonder Woman’s mission – her very world – falling apart around her would be reprised as part of the “Infinite Crisis” major crossover event in 2006. Events in “Infinite Crisis” force Diana to kill a villain named Max Lord in order to free a mind controlled Superman and save the innocent lives he poses a threat to. This act of boldness, resoluteness and courage – an act that neither Superman or indeed Batman would ever be capable of – results in immense personal consequences and sacrifices for Diana, her mission and her Amazon sisters, leading to the end of an era for “Wonder Woman”. Meanwhile at Boston Police headquarters, an officer takes Wonder Woman’s fingerprints as Ed Indelicato looks on. Nearby the Boston Police Commissioner is being interviewed in his office by another reporter, who asks whether the Amazon Princess is being accused of murdering Dr. Charles Stanton in Quincy? He replies that Wonder Woman had been questioned but no charges had been made. The surprised reporter reminds him that her lasso had been found at the crime scene but the commissioner declines to answer and makes his excuses to leave. In the corridor outside Ed apologises again to Wonder Woman for having to endure this humiliation but she says she understands they are as anxious to get to the truth as she is. She is then lead into an interview room and is told that Captain Ablamsky will join her shortly. As she waits patiently inside, she tells Ed that she grieves for his partner, Mike Shands, whom she had liked. She adds though that there is no way that her sisters could have murdered him – or indeed have done any of the things for which they are accused! He replies that she does not have to convince him but he is not exactly in the majority at the moment! Wonder Woman sighs and says that she is sure she can sort all of this out once she has spoken with her mother. A nervous Ed then stammers that he had not told her this before because he had been scared of how she might react – however, he continues to reveal that Hippolyta has vanished into thin air and that Hellene has been killed! Meanwhile the TV reports provide constant updates on the developing situation. Several anti-Amazon assaults have taken place across the country as panicked Americans reach hysteria over the brutal murders. In New York, Menalippe remains in a guarded hospital room after being injured during her arrest while Epione had been arrested without incident. In Gotham, doctors struggle to save the life of Phillipus while across other American cities, various other members of the Amazon Peace delegation have been taken into custody without bloodshed, including Mnemosyne and Timandra. However, reports had come in that two of the dead bodies carried from the Grand Hotel massacre scene had been those of Hellene and an as yet unidentified black Amazon. This mystery Amazon now raises the question of whether there are other unknown murderous Amazons at large! Back at Boston police headquarters meanwhile, Wonder Woman is trying to come to terms with the news of Hellene’s death. She slumps in her chair, sobbing that Hellene had not even wanted to come to Man’s World and had only done it for Diana’s sake. Just then Captain Ablamsky enters the room and thanks Wonder Woman for not making the situation harder than it already is. 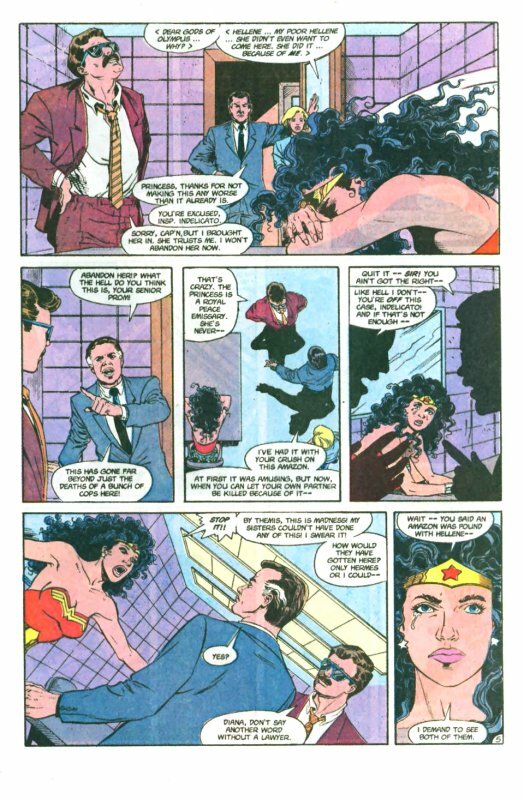 He tells Ed that he is “excused” but the inspector replies that he is the only person Wonder Woman trusts and that he will not abandon her now. An angry Ablamsky says that this situation has gone far beyond just the murder of several policemen. Ed replies that Diana is a Royal Peace Emissary and has never harmed anybody. 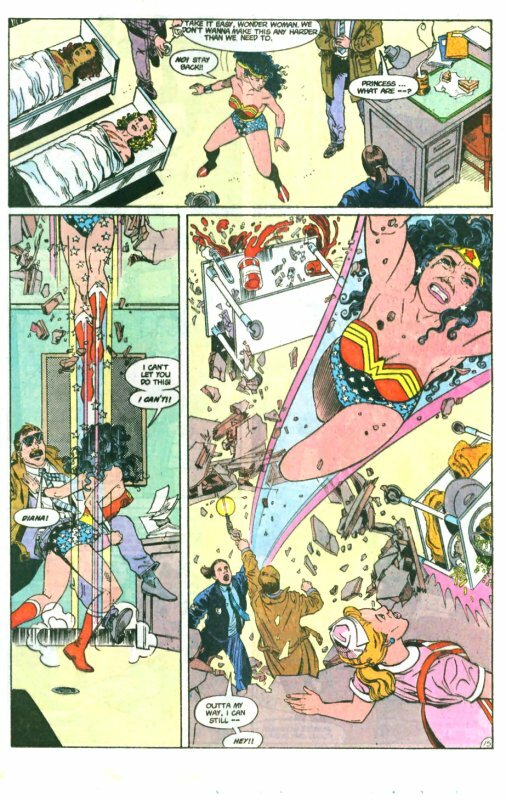 An infuriated Ablamsky explodes that he is fed up with Indelicato’s “crush” on Wonder Woman. At first he had found it “amusing” but now Ed has let his own partner be killed because of it. An equally angry Indelicato snaps back that Ablamsky has got it all wrong. As their voices continue to raise in volume Wonder Woman suddenly stands up and yells at them to stop. She tells Captain Ablamsky that there is no way her Amazon sisters could have perpetrated these crimes. How could the other Amazons have traveled here from Themyscira? Only Diana or Hermes could have brought them here! Ablamsky, sensing Wonder Woman is about to trip herself up, asks her to continue with what she is saying, but Ed warns her to stay quiet until a lawyer is present. 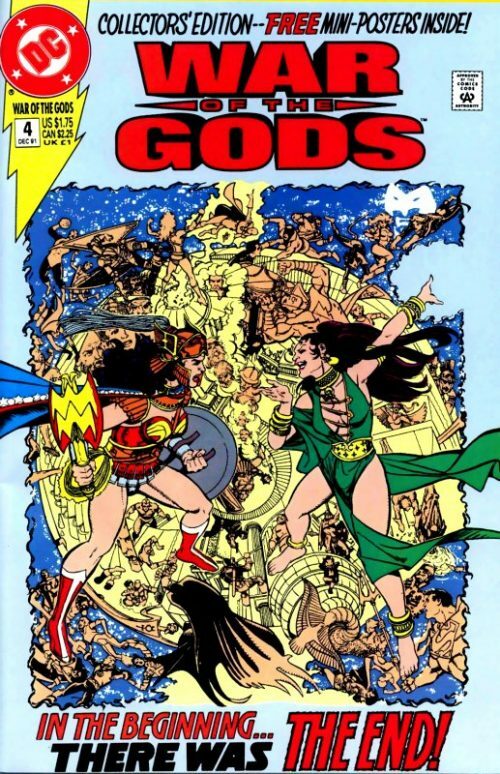 Wonder Woman, a tear falling from her eye, then demands to see the other Amazon who had been found with Hellene. Ablamsky reminds her she is in no position to demand anything and she again asks him politely this time. As the Captain asks her whether she wants to see the unknown Amazon because she might know something about her, they hear a commotion from the corridor outside and Vanessa bursts in, restrained by a couple of officers. Seeing Diana, Vanessa breaks free and crying, rushes into Wonder Woman’s arms. She sobs “She’s gone…Mommy just…disappeared…”. Elsewhere in a Gotham City bar, one of the male patrons asks the bartender to change the channel as news reports continue their wall to wall coverage of the Amazon crisis. The man jokes that he could easily take on the Amazons but the waitress is unimpressed. As the barman calls time he notices two young woman hovering quietly at the back of the room and asks the waitress to serve them. As she walks towards them though she sees their faces and recognises them as being the renegade Amazons Euboea and Pythia shown on TV! She cries out in terror and the other people in the bar turn to see what the matter is. As they too recognise the Amazons pandemonium breaks out and Euboea warns Pythia that judging by the commotion, they have been exposed. 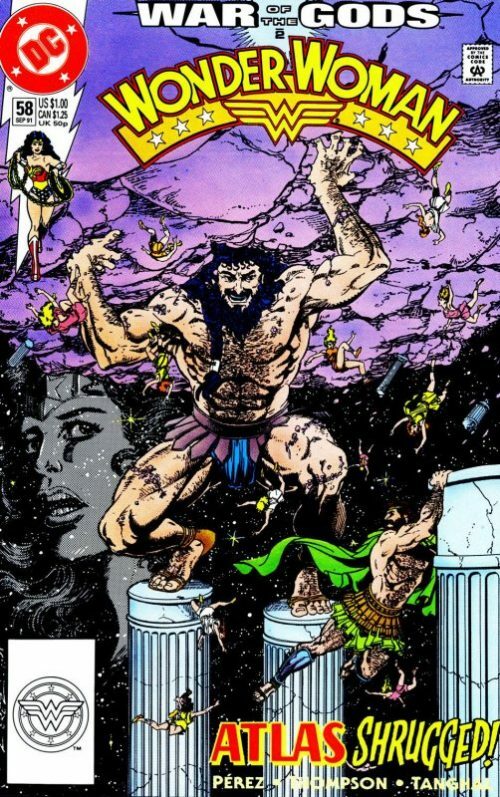 A while later in the Morgue, Wonder Woman is examining the bodies of Hellene and the mysterious black Amazon, while Ed Indelicato and Commissioner Gordon look on. A sobbing Diana looks down upon Hellene’s ravaged body and asks for forgiveness. Meanwhile Ed explains to Gordon that there is no way Diana had deliberately meant to kill the man in the crowd earlier. Gordon replies “Unfortunately, that doesn’t make him any less dead!”. He then reminds Wonder Woman that she has been brought here to look at the other Amazon. She turns to the second corpse and pulls back the sheets to reveal the unknown black Amazon. She tells them that she has never seen this woman before and whoever she is, she is definitely not from Themyscira. She is about to say something else but suddenly stops as she studies the deep claw marks on the corpse. She recognises the way the marks are spread out like a human hand and remembers those same claws tearing through her own skin in Bana-Mighdall. If it had not been for her enhanced healing abilities she too would have been killed. She realises that Gotham is also the location of Arkham Asylum; the prison where the Cheetah was incarcerated! She tells Ed and Gordon that the two Amazons have been killed by the Cheetah. Ed is shocked to hear this while a bemused Commissioner Gordon thinks she is referring to some escaped Big Cat from the Gotham Zoo! Just then another man enters the room and advises Gordon that the gunman who had tried to assassinate Wonder Woman has eluded them. He has simply vanished into thin air! As the Commissioner tries to take in this news he is also told about an incident at a bar, where two Amazons matching the description of Euboea and Pythia were reported shooting up the place! Gordon orders all units to head to the area immediately, warning that these Amazons are armed and dangerous. On hearing this though, Wonder Woman pleads that her sisters speak little or no English and will not understand what is happening. The police cannot simply hunt them down like wild animals! Ed suggests that perhaps Wonder Woman should go after the two fugitive Amazons and Gordon cannot believe his ears! He reminds Ed that the crowd outside are yelling for blood and he cannot afford anymore “whackos taking potshots at her!”. Wonder Woman says that if the police try to go after Euboea and Pythia, more innocents may be killed, including her sisters. She cannot allow that to happen! 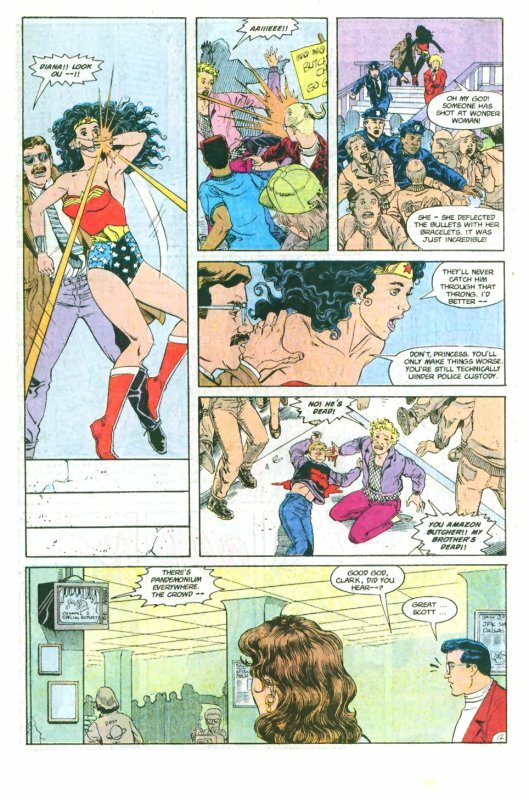 As police officers advance on her from two sides Wonder Woman warns them to stay back. As Ed tries to calm her down she suddenly shoves him out of the way before launching at lightning speed up through the ceiling and out through the roof! As an officer tries to shoot her, Ed knocks the gun flying while outside, other police men open fire but the Amazon Princess is long gone before they can even pull their triggers! The TV crew outside manage to catch the red, blue and gold blur flash by and across the nation people watch in amazement, including Clark Kent and Bruce Wayne. 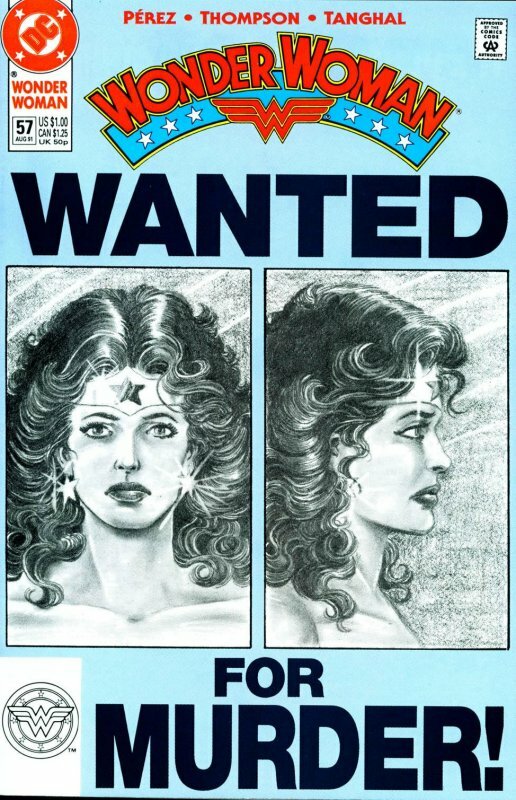 The news report states that Wonder Woman has apparently escaped custody and that if the current Amazon threat was not bad enough, now the most powerful of them all is loose! The Amazon who once professed peace as the greatest virtue. “This is a dark day indeed”. Many miles away meanwhile at Dr. Charles Stanton’s residence, Captain Otto instructs one of his men to remove the glowing golden lasso which is still draped over the chair where Dr. Psycho had left it. The officer, fully dressed in a radioactive suit and helmet, is uneasy and says to his captain that they have no idea what this rope is capable of. An impatient Otto urges him to continue with the removal operation but as the officer steps forward a red, blue and gold streak flashes past his eyes. The next instant he is staring at an empty chair – the lasso has vanished! 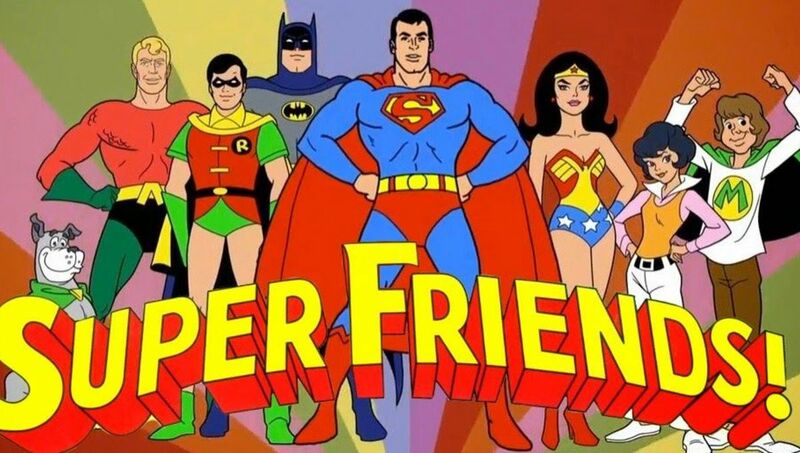 Just then they hear an APB over the radio that Wonder Woman has escaped from Gotham and may be trying to retrieve her lasso. It appears she already has!! A few moments later across the country in Washington Hospital, New York, Lt. Scaffidi checks on the policeman guarding the hospital room where Menalippe is recuperating. Scaffidi warns the officer that there may be trouble on the way but he is assured that everything is quiet and that there is also a female officer inside with the suspect. Scaffidi says that he wishes to question the Amazon Oracle but when the locked door is opened, they are shocked the see the policewoman lying unconscious on the floor, the bed empty and the curtains billowing as the wind blows through an open window!!! Menalippe has gone! Meanwhile in the darkened streets of Gotham City, Pythia and Euboea are running for their lives down an alleyway with a police car in hot pursuit! The desperate Amazons find themselves in a dead end though and turn to face the approaching police in fear. The officers order them to place their hands over their heads but Pythia and Euboea instead effortlessly leap over the fence. As they land on the other side though they are surprised to see Wonder Woman and Menalippe standing there waiting for them! The Amazon Princess explains that she had heard the news bulletin about the incident in the bar and had flown over the surrounding area, simply hoping her keen eyesight would enable her to spot them in the maze of streets below. She continues that there is no tine for talk and that they must return to Themyscira quickly and get Menalippe to the Isle of Healing. Pythia and Euboea ask about their other sisters and Wonder Woman replies that they will attend to them at a later date. The authorities are restricting access to the other Amazons with every passing minute and it is simply too dangerous to try to free them without more people getting hurt. Elsewhere, Steve Trevor listens to the TV and radio reports which tell of Wonder Woman’s daring rescue of Menalippe, the worsening condition of Phillipus, the continued mystery as to the whereabouts of Queen Hippolyta, Julia Kapatelis and Lord Hermes and the fact that Captain Ablamsky of the Boston Police has now issued an arrest warrant for the fugitive Wonder Woman, who is now to be considered extremely dangerous! Steve listens incredulously and tells Colonel Yedziniak, who stands behind him, that this must be some sort of frame up! Another report coming in then announces that a state of war may well be declared between Themyscira and the United Nations! On hearing this Yedziniak says that he had been right all along about the Amazons and their “pacifist facade”. He continues that the military are going to need all their firepower to get Wonder Woman. “I’m going to blow her and her witch sisters to kingdom come!” he states coldly. “And you Colonel Trevor are going to help me!”.